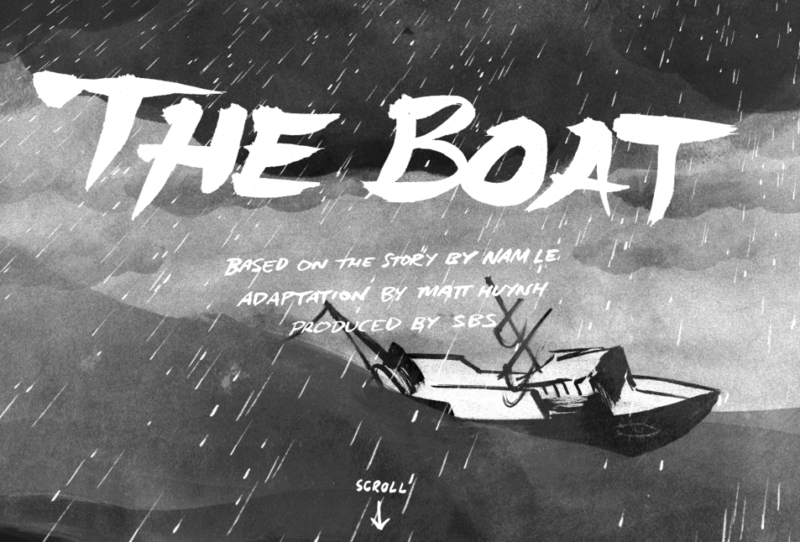 I found myself listening to a Digital Arts programme on Radio 4, and a discussion of The Boat, an interactive graphic novel by Matt Huynh. Intrigued and excited by the idea of a new art form, a new way of forming narrative that combined illustration and animation differently, I did something I rarely do - I went online and watched it immediately. And I can't work out what I think, actually. I loved it. I wanted to love it. I dreamed of being surprised by something utterly 'out there' and beyond anything I could conceive, while still being beautiful and illustrative (I'm not so fond of the overly digital stuff). I am always waiting to be surprised by something I've never even imagined, so you can guess how high I set my expectations! 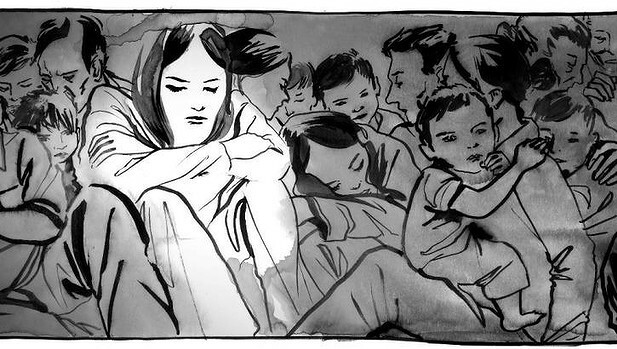 I watched (and read) Persepolis some time ago and it has also set the bar extremely high - nothing has beaten it since! I'd like to mention that my experience of graphic novels is mixed, too. I'm frequently entranced by the beauty of the cover, and often frustrated by the generic 'comic strip' style of the illustrations. I expect too much - there is a lot to fit into small images that need to be understood quickly, and so it makes sense that they are simple and usually monochrome. Meanwhile, I am an avid reader - more than anything else, I relax by sinking into the world created by whichever novel I'm reading at the moment. 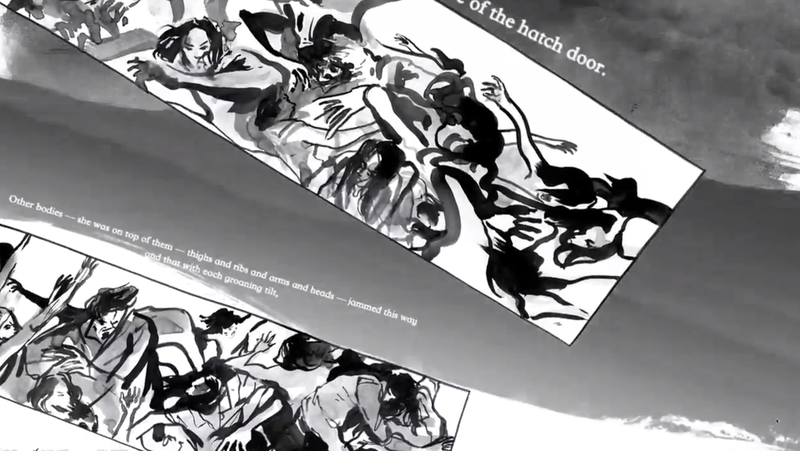 So graphic novels sometimes fall short of my narrative, literary need by feeling a bit too simplistic, and I read them too fast - I don't know how to dwell on them, to soak in the depth of the story visually rather than descriptively. How was The Boat going to fit in with all this experience, these expectations? Well. The introduction was bewitching, enticing - beautiful, inky brushstrokes creating an animated scene that set the whole stormy backdrop beautifully. 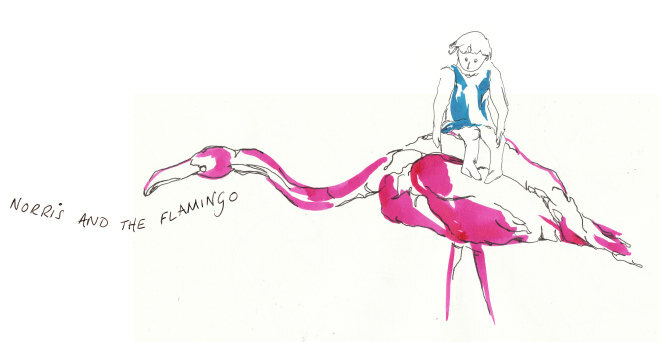 And throughout, the illustrative style was exquisite. Emotive, painterly, atmospheric. 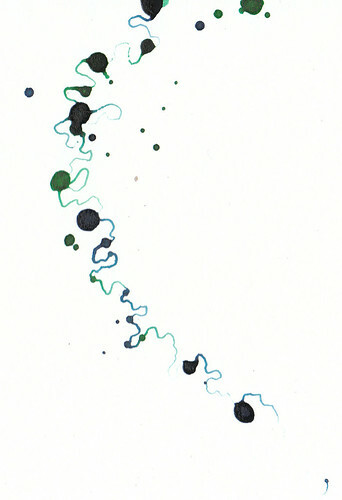 I loved that I could see the layers of ink used to build the story. I loved that the artist allowed pools and blotches to play their role. I think I also liked the text. As mentioned above, for me it served well to deepen the story, and I found it beautifully written. A couple of the panelists commented that it was perhaps 'overwritten', and having seen it, I suspect they were referring in particular to a few sentences towards the end which were absolutely, painfully unnecessary, when the images would have stood alone perfectly. But I can't help wondering how much was added to the piece by making it a digital work? The radio show played a piece of music that was used within the soundtrack and I was thrilled by the idea that the piece had a musical soundtrack. It returned me to ideas that I first explored with Kandinsky and friends through The Blue Rider - this group of artists, musicians and philosophers were absorbed by the inter-relation of art forms. Anyway, the music was beautiful, but actually it was a song that supported two particular parts of the narrative. The rest of the soundtrack was very sensitively done - the sound of waves, for example - a click or a shudder to correspond with a sudden movement on the boat. And a lot of silence. While I'm glad that the soundtrack wasn't over-worked, I also couldn't help feeling that perhaps it was hardly necessary at all. What I most often felt myself wanting was a voice - a voice that narrated the story. It felt strange to read the words on screen, amidst animation and soundtrack. Perhaps I am too embedded in film culture. So I'm still a little undecided. I have watched a beautiful, evocative graphic novel with a stunning short-storyline that as a narrative was, I think, spot on. I'm happy and inspired, but I feel as if I watched it through a powerpoint presentation with some amazing gimmicks! I thought this might finally convert me to the possibilities of the digital world, but perhaps at the end of the day I'm still just a luddite, who loves the feel of paper between my fingers and the space to pick up and put down a book as often as I like, wherever I like.